Peg in the hole. Black as Newgate's Knocker when cleaning my ears when I was small. What you doing up there, a clog dance? Ed, I do not know him by name, but possibly would recognise him by sight. I don't think he was on the same watch as mine where contact with colleagues on other stations is most likely. 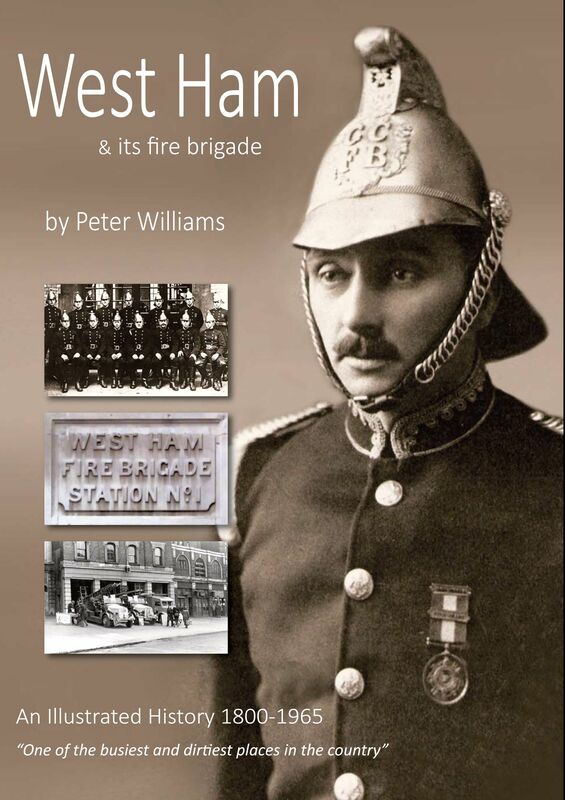 This book looks at the development of West Ham as part of the wider East London area, and how West Ham’s position influenced the development of its fire brigade. From haphazard arrangements under the old parish vestry system in the 1850s, the book tells the story of the development of systematic public services, such as the fire brigade, during the period of rapid industrialisation and development after the coming of the railways in the late 1830s. Many new industries were located in West Ham including those smelly, offensive and dangerous trades no longer permitted in London proper after the mid 1840s. The area east of the River Lea saw many industrial innovations in petrol, chemicals and early plastics as well as the refining of products in the docks from the trade of the Empire, most notably rubber and sugar. All this had an impact on the fire brigade, which had to professionalise rapidly to meet all the risks in the borough. West Ham Fire Brigade became known as an innovator in equipment and techniques – and faced its greatest challenge ever in the 1940s with the Blitz on the London docks. After the period of the National Fire Service in the War, the Brigade returned to West Ham Council control and survived until April 1965 when it became part of the London Fire Brigade. About 140 pages, about 150 black and white and 15 colour photographs. Ken, You may be interested in the link below to a 1893 Ordnance Survey map of the docks which you will need to copy and past into your browser. I have centred in on the old Customs House where the Queens pipe used to be located. I did check on Google maps but it all seems to have gone now under the Excel Centre and its environs. Interestingly enough, It was the Custom House in the docks that the surrounding area was named after. An earlier 1867 version of this maps shows Custom House and much of Canning Town did not exist at all at that time. Everything north of the dock wall was marshland. 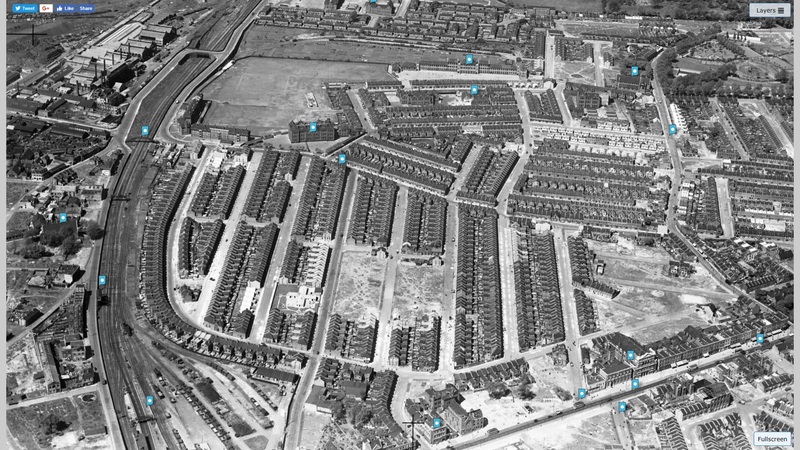 Even Victoria Dock Road was called Liliput Road then. The second link is to the earlier map. The maps can be zoomed in and out. Ken, This was located just inside the Royal Victoria Dock wall near the junction of Victoria Dock Road and Freemasons Road. You could see it from the roadway. We used to call it the Queens Pipe. It was certainly here until the docks closed and were opened up to the public. Something most of us are used to whether we worked in the docks of have seen pictures of them, is seeing ships moored alongside the quayside. However this does not always appear to have been the case. 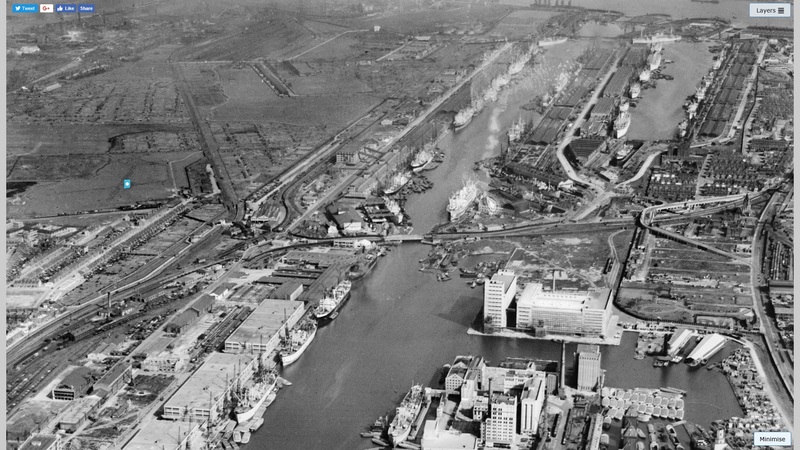 The 1934 picture of the Royal Victoria Dock shows ships used to moor stern end onto what is now the quayside with further jetty extensions protruding from the main quayside into the dock. I would assume this arrangement allowed more ships to moor at the same time. Photographs from the 1940's onwards show the extension jetties had gone be then. Hello Andy, Great to hear from you again. I did find another photograph on the Britain from Above website that was obviously taken at the same time as the one you have already seen. This one is centred on the old Rathbone Street with Barking Road running through the middle and reaches as far east as the Barking Road/Star Lane junction. I did zoom into the circular features you mention which you can do on their website although there comes a point where definition starts to break down with the greater magnification. At first I though these circular features looked too shallow to be Emergency Water Supply Tanks (EWS) but I found another one which was still full of water located on Hudson Road. I also looked up images these tanks on Google which confirms that is exactly what they are. The one on Google are brick built and look about four feet high, but they do contain a good supply of water. I also note there is a row of five Nissan huts in Percy Road and in the second photograph, (unpublished here), there is a row of prefabs running either side of Fisher Street. Historical Newham / Re: Wives of Henry VIIIth. Doug, I did try researching this but could find no definitive information online. That really only leaves supposition, but I think even so, that reasonable deductions can be made. Although there is also a Howard's Road in Plaistow, I think that can be dismissed from the equation. Although often thought to be in West Ham, possibly because of the name of the adjoining football ground, Green Street House, (Boleyn Castle), was actually in the Borough of East Ham as eventually was West Ham Football Club with the boundary line between the two boroughs running down the middle of Green Street. This meant that East Ham Council, then I still think under the Essex County Council, would have had responsibility for the naming of roads in this area. The Ordnance Survey map of 1892-1914 shows there were insufficient existing roads in the surrounding area at the time to include all the names Henry VII's wives or associated Tudor names. The northern tip of this block of roads was still bounded by the ornamental lake which had been part of the gardens of Green Street House. To the west after Aragon Road, no further roads are shown as coming north off Barking Road other St Bernard's Road before High Street North is reached. My best guess and it is only a guess, is that Howard Road East Ham was named when that particular development came along, and developers were looking for street names at the time. As a point of interest, one reference I had in the London Fire Brigade before I retired, was to approve all new street and building names within Greater London. One thing I would certainly not have approved was two roads named the same within 2 miles of each other and certainly not in the same borough. However both Howard Roads were named at a time when different criteria applied. This is another picture I came across on the Britain from Above website taken. Due to the amount of detail in the picture, I have split it in two. It shows Canning Town north of the Barking Road and stretching all the way to Stratford. Being taken immediately post-war, extensive bomb damage can clearly be seen. To assist getting ones bearings, The Royal Oak and Canning Town Public Library in Barking Road can be seen centre bottom of the picture. The Peggy Leggy steps can be seen to the top left and if scrolled right, the as yet undemolished Trinity Church and be seen on the corner of Hermit Road. Hilda and Pretoria Road Schools can be seen top centre (right). 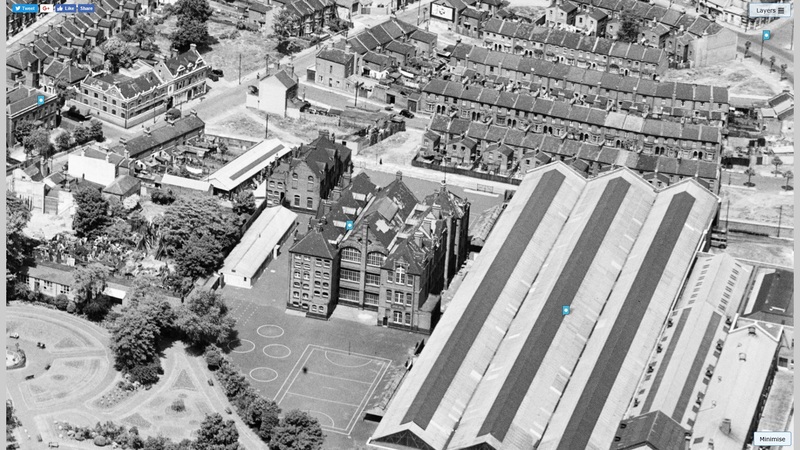 In the second picture Manor Road Buildings and the Memorial Recreation Ground can be seen. 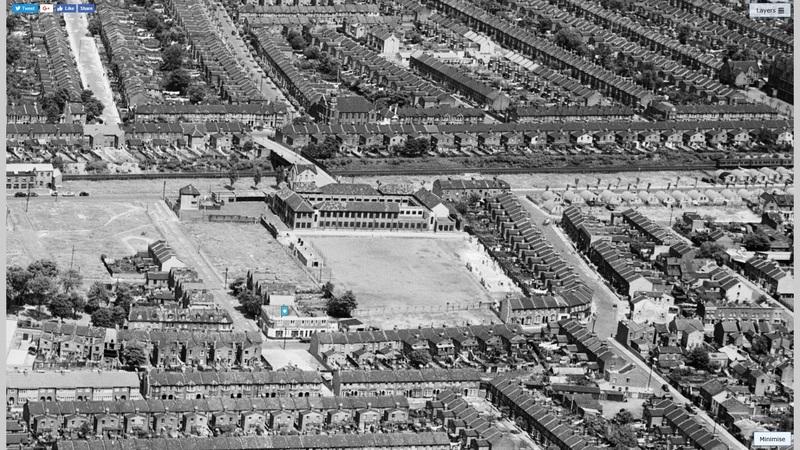 I think the white dots on the recreation ground may have been connected with the WW2 AA Battery that used to be there. This particular thread was well subscribed to in the past by previous members, and hopefully if they still have the same email addresses, they should receive an email notification. Scroll right to view more of the image. 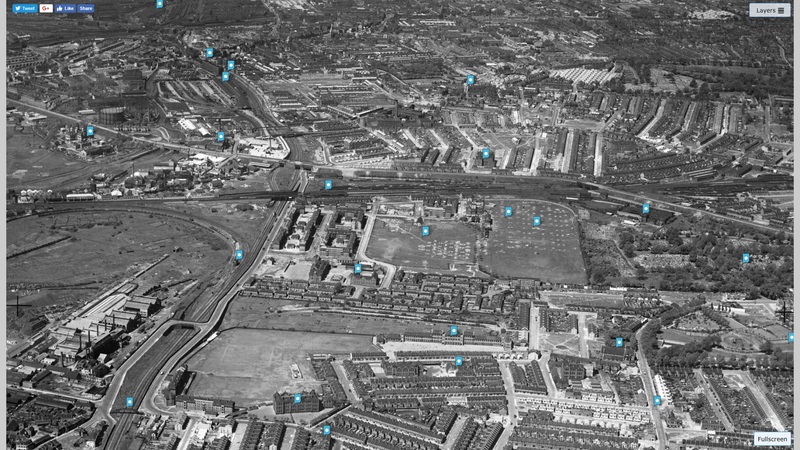 Newham memories and nostalgia / Re: understanding the past history of newham ,. 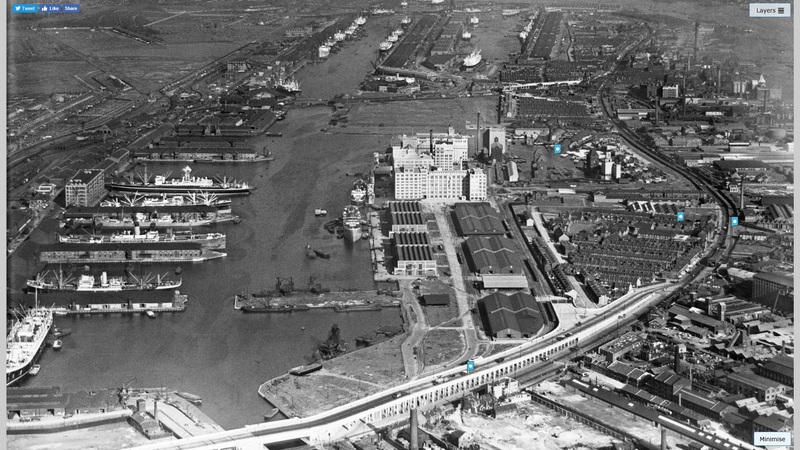 This aerial picture of Royal Docks taken in 1946 from the Britain from Above website kills two birds with one stone. On one hand for those that either worked in the docks, or are interested in Newham's Industrial history, it shows just how busy the docks were with shipping in the immediate post-war years. For those of us with grandchildren, one can show just how busy the docks really were. The other feature of this picture is the site of KenM's long await query about the barrage balloon on Vernon's Fields. The Blue marker on the top right of the picture expands when using the Britain for Above website to reveal the words, "WW2 Anti-Aircraft Landing Deterrent Ditch and Mound". Provided Ken knew where this was located, he should be able to triangulate the position of the barrage balloon. I said earlier that the crews that initially attended Ronan Point about 5:30-6:00, were completely knackered when they returned to the station after 9 am. I only got the chance of a brief chat with them then as I was part of a crew required to immediately replace them. It was not until some days later that particular watch came back off leave and we were able to chat more properly as our watches swapped over. As you can imagine when the first two crews initially arrived together at Ronan Point, it was a scene of devastation with bits still falling from the building. They had no way at that time of knowing if anyone else was in the building or whether the building itself was going to collapse further. The officer in charge immediately sent a short coded priority message by radio which meant he was asking for a lot more help in a big way. No explanation is required in these messages as when the OIC says he needs a lot of help, he gets it. They then raced up the internal staircase with a couple of them stopping at each floor while others went to the floors above, to evacuate anyone that may have still been inside the building. They simply kicked in the front doors with their fireboots to gain access. Due to the urgency of the situation, there was simply no time to politely knock on the door and wait to see if there was an answer. Some of the doors towards the top led to open air on the collapsed side. I have run up to the top of some of these flats before to get access to lift motor rooms when someone was shut in a lift, and I can tell you its knackering. As more machines from adjoining station and some specialist machines from further afield rapidly converged on the scene with senior officers, other messages were sent requesting the police shut off all access from surrounding roads except for emergency vehicles. The London Fire Brigade also had a one mile air exclusion zone set up around the incident. This was because news helicopters started appearing and it was feared their vibrations could cause further collapse. The task of my crew when we arrived was to try and determine if the was anyone still missing as at that it was still unknow how many people if any were still trapped under the rubble. The rubble by the way was till mainly large slabs of concrete. Once it was established that everyone had been accounted for and surveyors had determined the building was unlikely to collapse further the fire brigade left the scene. Other welfare agencies are involved in the emergency re-homing of those suddenly made homeless. 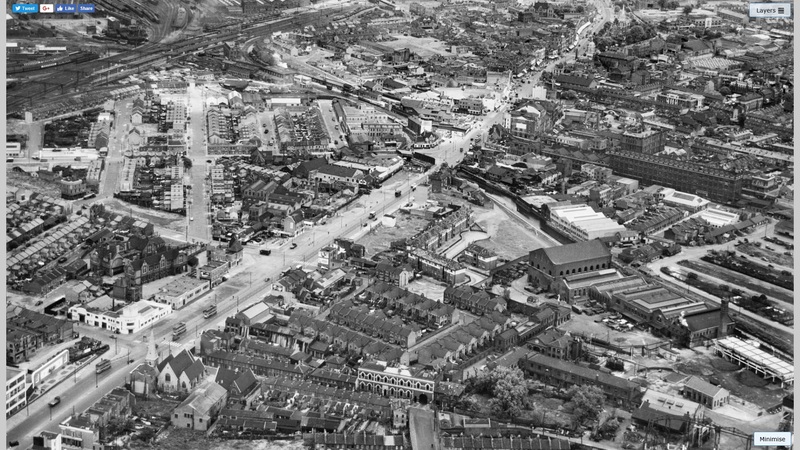 A aerial view of High Street, Stratford taken in 1952. I have split the picture into two sections, as justice is not done to the amount of detail in it if it were condensed into one picture. Trolley buses can be clearly seen heading to and from Bow Bridge. The duelling of the High Street does not yet seem completed and there are views of buildings since demolished. 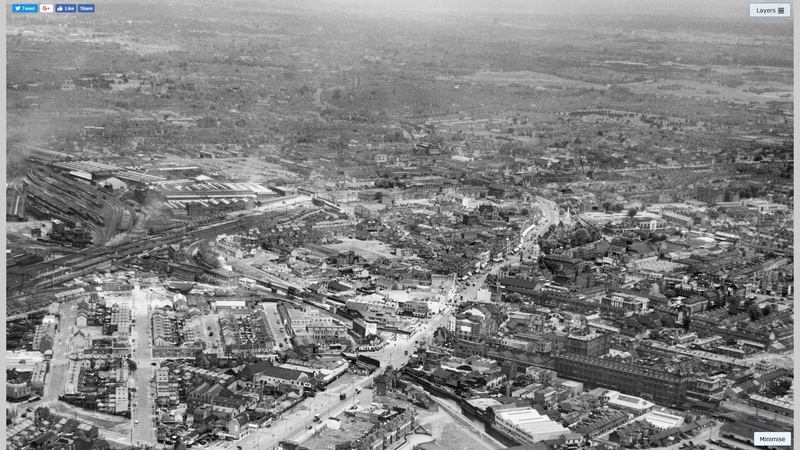 In the distance, Stratford Broadway, Angel Lane and the whole layout as far as Maryland Point can be seen. The start of Romford Road by Young and Martin is also visible on the right. In the far distance are Wanstead Flats, Leytonstone and Wanstead but they become a bit more hazier due to the distance involved. Ed, Ronan Point is forever a place etched in my memory. I went to that incident, not on the original call but I relived the crew that was there when I came on duty at 9 am. They were well and truly knackered. At that time it was not known if anyone was still trapped in the rubble, but once it was established everyone was accounted for, the fire service left the scene. It was a giant clear-up job after that. Ken, I believe I have found a picture of the West Ham School of Building. Queens Road and Carter Road Bridge crossing the railway line to the north. St Mary's Road to the south. Complements of Britain from above website. Burke mixed secondary modern school, Plaistow, originated as Balaam Street board school, opened in 1897 for 1,556, as successor to the old Balaam Street school. 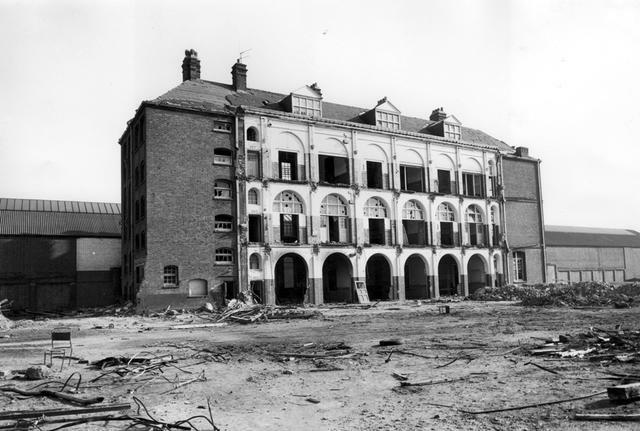 On each floor it had a large central hall flanked by classrooms, to facilitate direct control by the head teachers. In 1930 it was reorganized for senior boys, senior girls, and infants, and renamed after Edmund Burke the statesman, who lived in Balaam Street for a short time. It became a mixed secondary modern school in 1945. 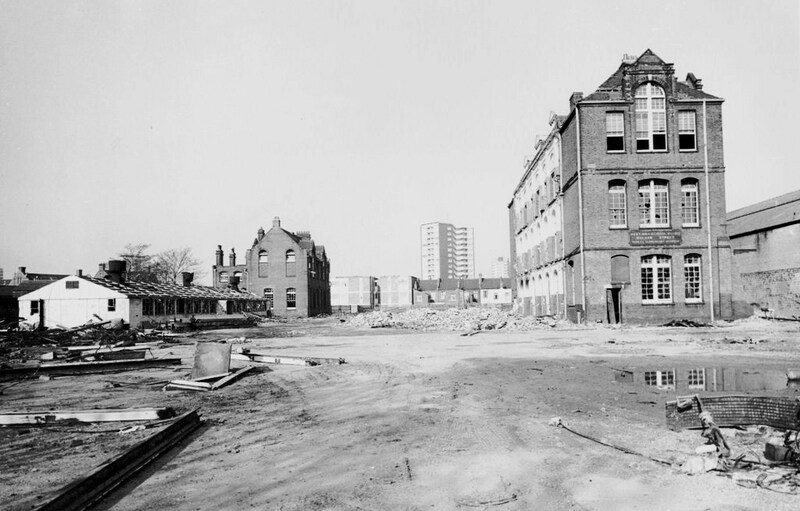 The pictures below shows Burke Secondary School during demolition in 1973. The wall at the rear of the school is West Ham Bus Garage. Page created in 2.064 seconds with 22 queries.